The story is very simple: A baby lizard loses his tail in an unfortunate accident at the drawer that he was scooting through, having fun. When he asks his mom, she says, well, maybe it is time for you to get a new look, which is rather confusing. The little lizard thinks this meant that he should go find a new tail. So he sets off to find a new one. He meets a host of animals, one by one, squirrel, monkey, cow, dog, cat, and elephant and asks them if they will sell their tail so he can have a new one. They all refuse in their own unique way, while highlighting the virtues and uses of their own tails. Disappointed, he goes back to his mom who laughs gently and asks him to look at his own tail. And guess what? It's not a stump anymore, it has started to grow back! When I read the book to my kids, I couldn't help but be influenced by Vidya Balan's gentle, warm, and cheerful presentation as I tried to recreate the magic, minus the songs and sound effects. The inviting Will You Read With Me? sets the tone for this series that helps children read-along as they listen to the CD. 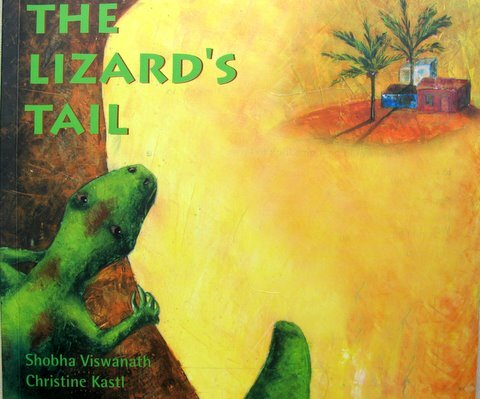 The Lizard's Tail together with Little Vinayak have become a recent favorite in our household. The palette-knife illustrations by Christine Kastl are gorgeous and they complement the story well. The texture and crackle-like finish with ridges made my daughter wonder at first if the art work was done with her favorite Watercolor-and-Cling-Wrap method, but after we read the back cover, it gave me a chance to give her some basic information about palette-knife painting which creates great textures. The music in the audio version is catchy and upbeat. 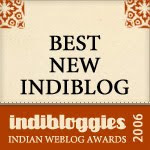 I liked that after hearing this CD, followed by a few more of Karadi Tales' ones that we've listened to, it is almost impossible not to hum/sing the tunes. While it is true that not all books appeal to all children (and adults) alike, I am quite happy to have found a handful that appeal to both the 2½ and 5 year old at the same time: the text is comfortable enough with just a few challenging words for my five-year-old to read by herself, while the flow of the story and the parade of animals easily hold the 2½ year old's attention. We've enjoyed many a car ride with Karadi CDs, which as you rightly poined out is hummed by the adults, toddler and 6 yr old! Sheela, the water color technique mentioned is very interesting. Thanks for the pointer. This book seems so interesting. I am sure my daughter will love this story. Thanks for sharing this one. This is one of the most played CDs on the car rides. I like the part when the lizard gets upset that everyone tries to feed him. Gels so well with our natural instict as hosts to offer something to eat first. ah... we have this one too and the kids love it. and you're right, the illustrations are lovely.